Sharon Olds is perhaps the queen of the confessional poetry school of writing, (Helen Vendler once caller her writing “pornographic”), and she does not let us down in this recording of her divorce after 30 years of marriage. Ms. Olds always writes from the gut and sometimes the heart in intimate images that often disturb as much as reveal. She keeps her finger on the pain of living, of love and loss, of inner turmoil, yet sometimes she pressing that button a little too often too deliberate. And so enter the tumbling world of divorce where bodies and temperaments writhe in tattered confusion. The book has a nice seasonal structure as we move with her through the aging of divorce. Olds becomes more invisible to herself yet more powerful in her verse. Though again, the lines ring with flat tones, their truth is clear. The journey is there for those who have taken it to reflect, for those who have not to consider. Though Ms. Olds is rather over fond of the enjambed lines that break off or drop into the next line against syntax, sometimes it just reads flat like prose. 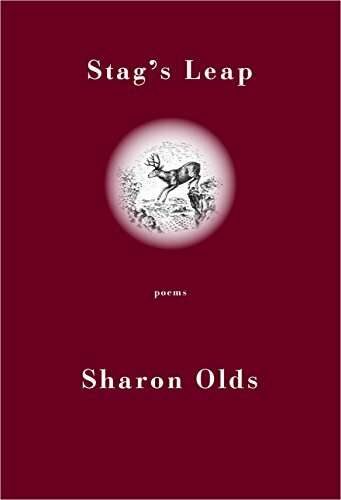 For example, in the title poem “Stag’s Leap” we learn: “Then the drawing on the label of our favorite red wine/ looks like my husband, casting himself off a/ cliff in his fervor to get free of me.” A nice image but a terribly flat line perhaps more appropriate for memoir.